On Friday Rich went away with work for a week, leaving me on my own for a whole weekend with only brunch with the girls planned on Sunday. Having seen the #photoanhour tag floating around on Instagram in the past, and posts done by other bloggers in a similar vein, I thought I would attempt it myself, and it would provide me with a welcome distraction from being on my own! 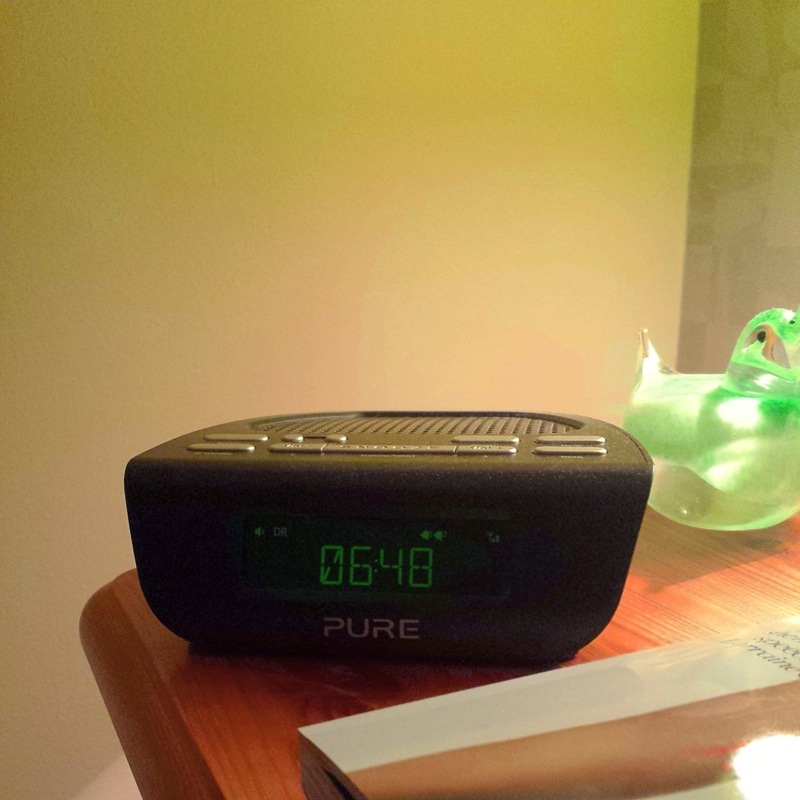 7am (ish): The day started out pretty early, I normally wake up for work at 6:15 am, and don't find it an issue to fall back asleep normally on a weekend. However without Rich in bed with me I struggled to drop back off, so I gave up after half an hour of trying and began my usual morning ritual of checking Facebook, Instagram and Twitter. 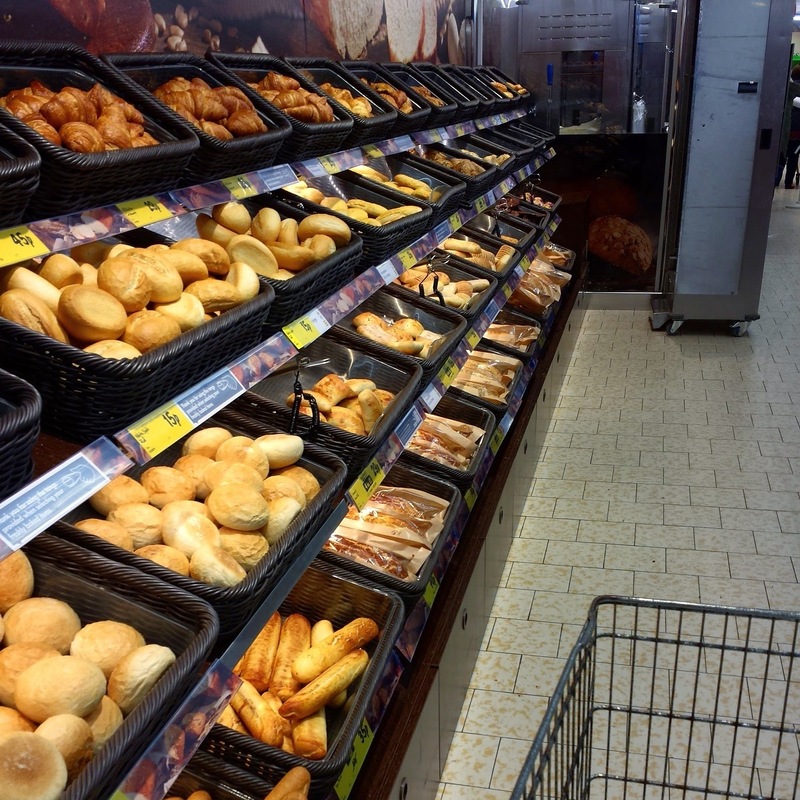 8am: As the cupboards were bare I headed to Lidl to do a weeks food shop. 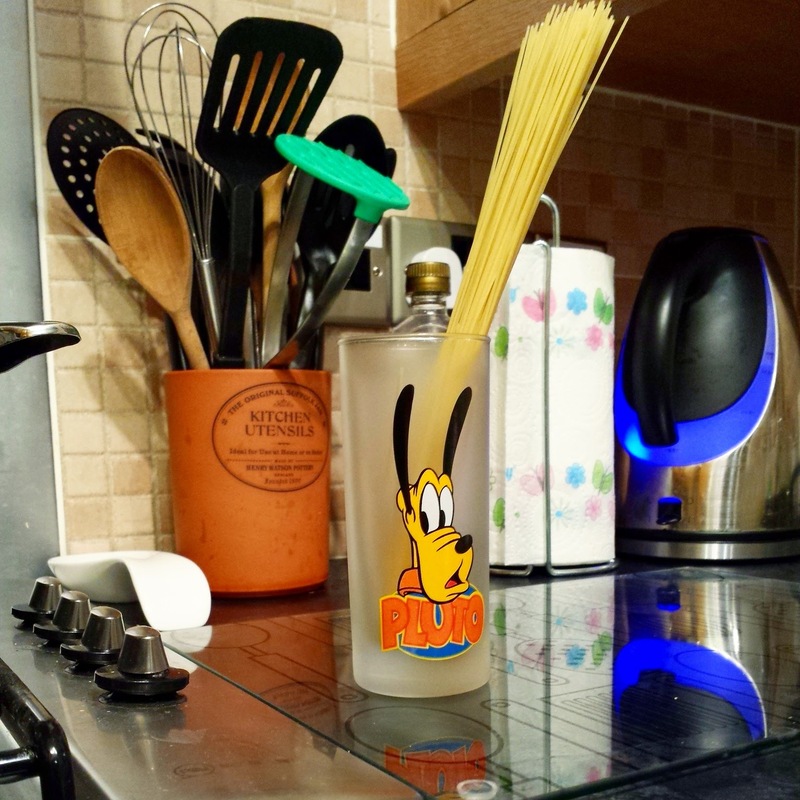 We have only recently switched to Lidl from Sainsburys, and are very impressed with the savings we are making! It's all in an effort to save money for our wedding next year, and I will be doing a post soon on how we are making and saving money, if anyone's interested. 9am: Food shop done, it was time to head into Leeds to begin Christmas shopping. The train is so cheap from where I live it is barely ever worth attempting the mental roads to head into town, much easier to get the train. 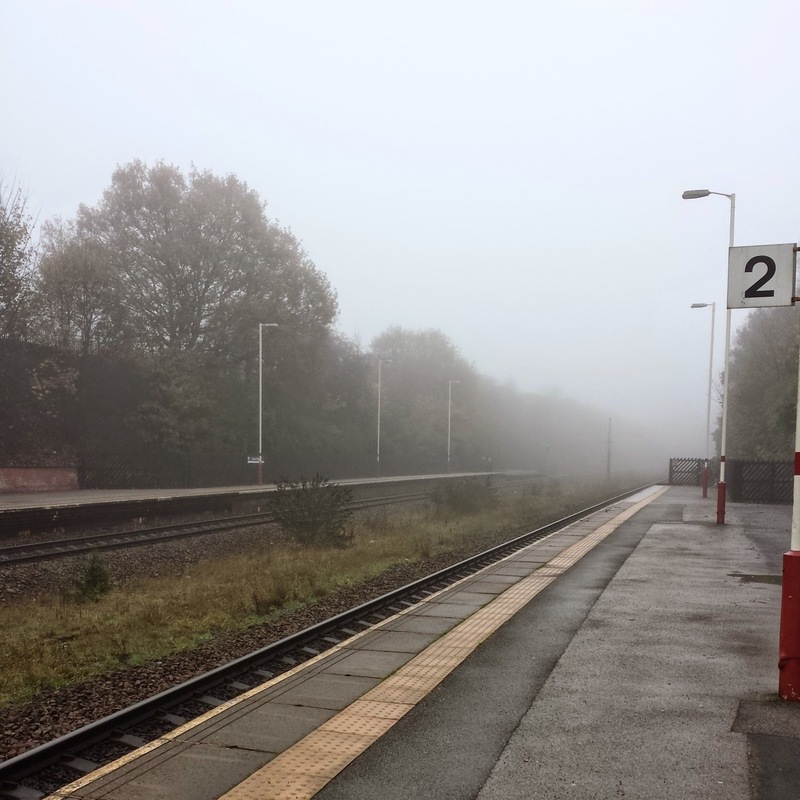 It was really foggy on Saturday and it made for a wonderfully eerie picture whilst waiting in the cold. 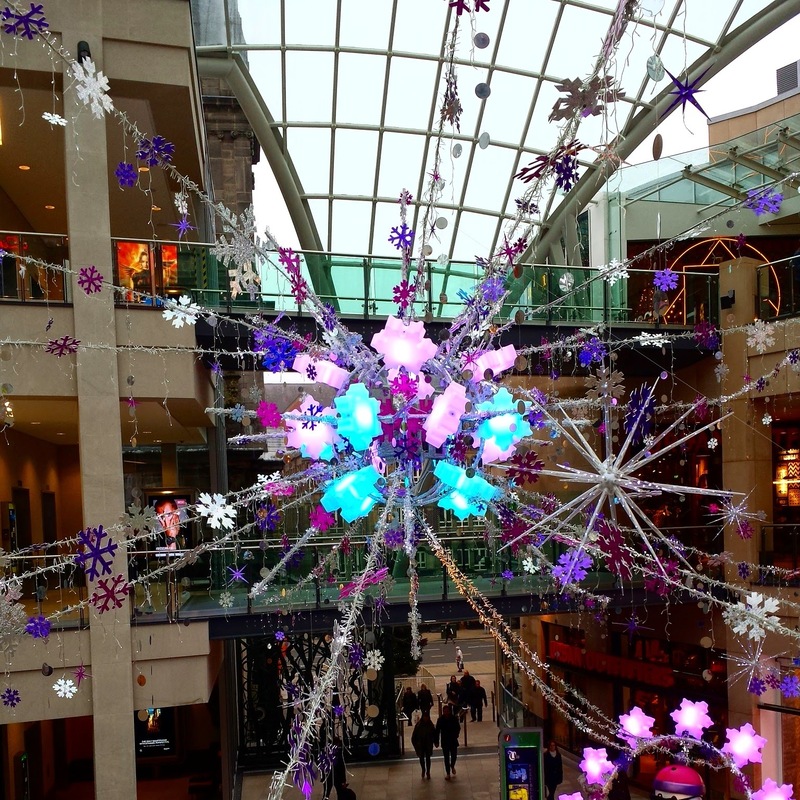 10am: All of the Christmas decorations are up in the Trinity Centre! They look so sparkly and festive, and I am a huge fan of the reindeer which seem to be dotted all over Leeds. Hearing all of the Christmas music in the shops and seeing all of the decorations has really got me in the Christmas spirit now, and I'm itching to put my tree up, but I know I need to wait til December really. 11am: Taking a quick break from the craziness of shopping to get an orange hot chocolate from Costa, in the Christmas cup of course! This was such a yummy hot chocolate, it is topped with a swirl of belgian chocolate, which melts and leaves you with an amazing lump of melted chocolate to slurp at the end of the drink. I was a little disappointed that I couldn't taste much orange to it though, but it was still a good hot chocolate. 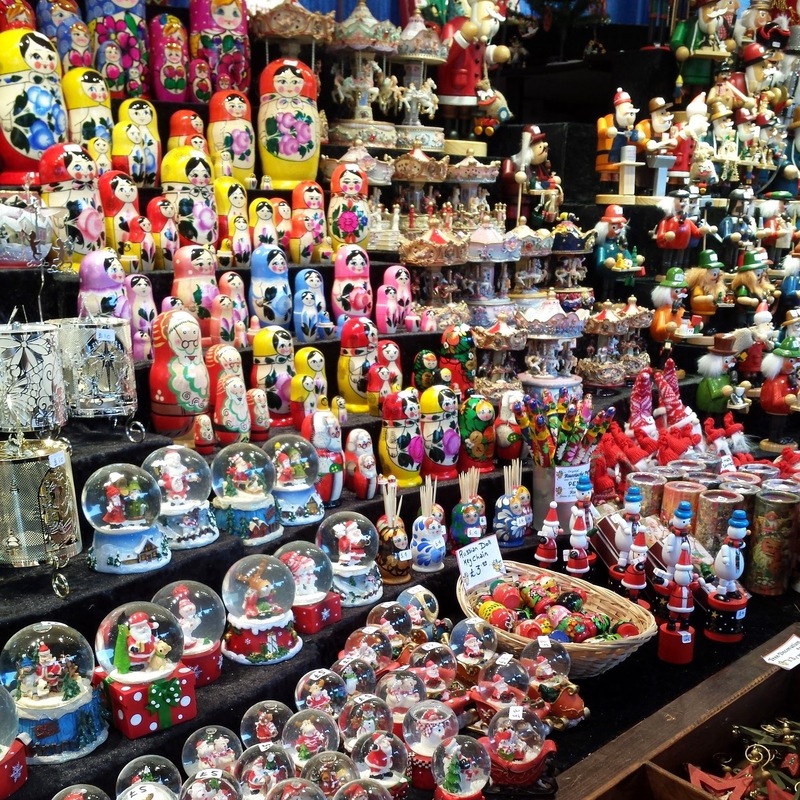 12pm: The German Christmas Market is back in town again! I always love wandering through the stalls and looking at all the wares, however after going to the Birmingham one, which is huge, the Leeds one always seems a bit small to me. I managed to pick up something I really wanted to get for people for Christmas though, which is a bit delicate so I was pleased I could go whilst it was quieter than usual to pick them up! 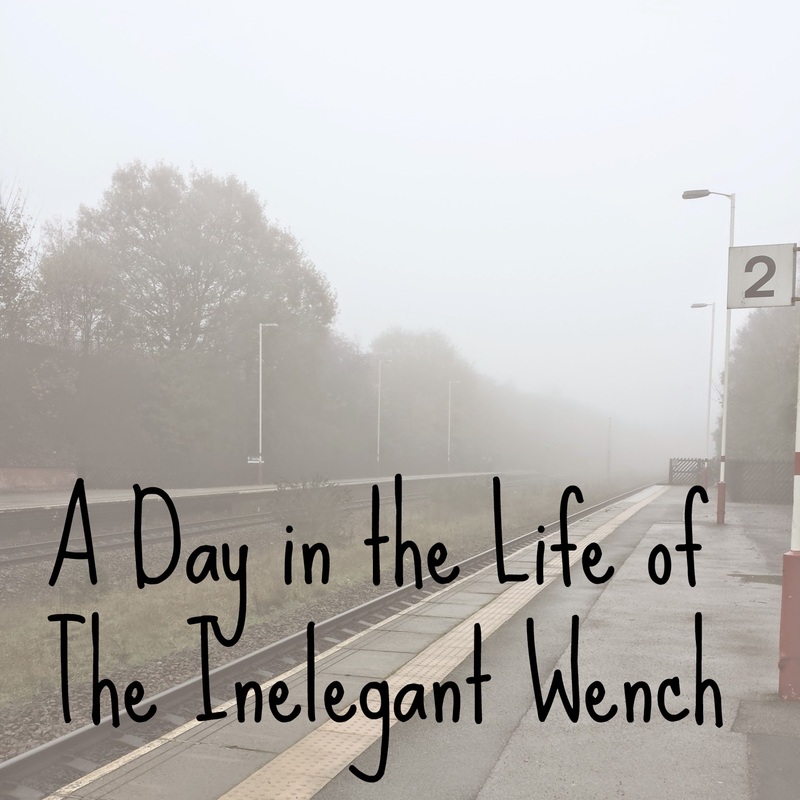 1pm: My bags were getting too heavy and Leeds far too busy by the time I was done with the Christmas Market, so I headed home to get some lunch and put my feet up. 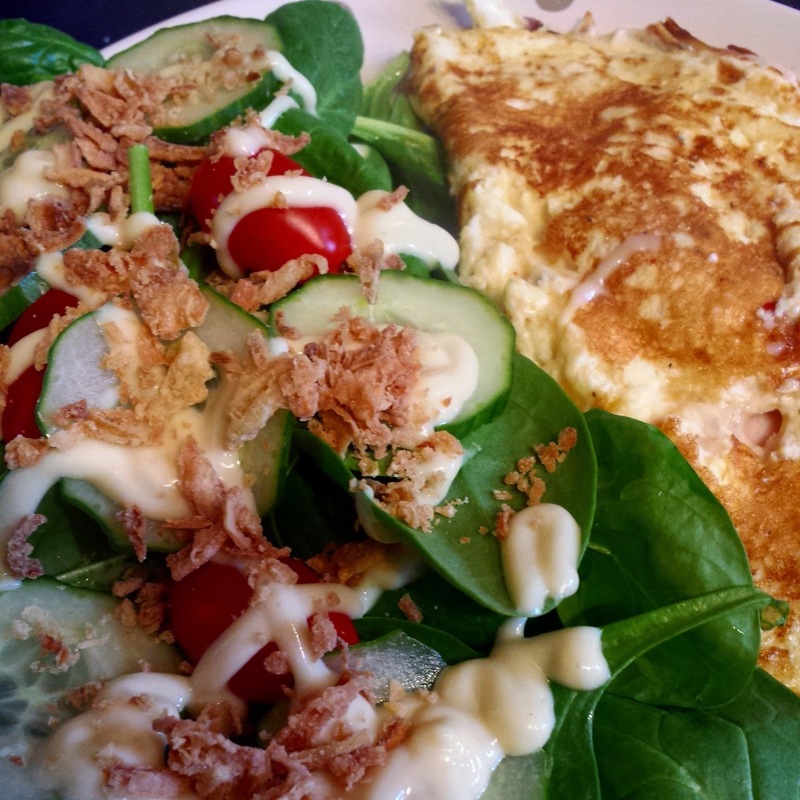 Ham and cheese omelette with salad was what I had for lunch, I am still on WeightWatchers and fast approaching goal, so I was trying to be good, and this wasn't too naughty points-wise and very satisfying as well. 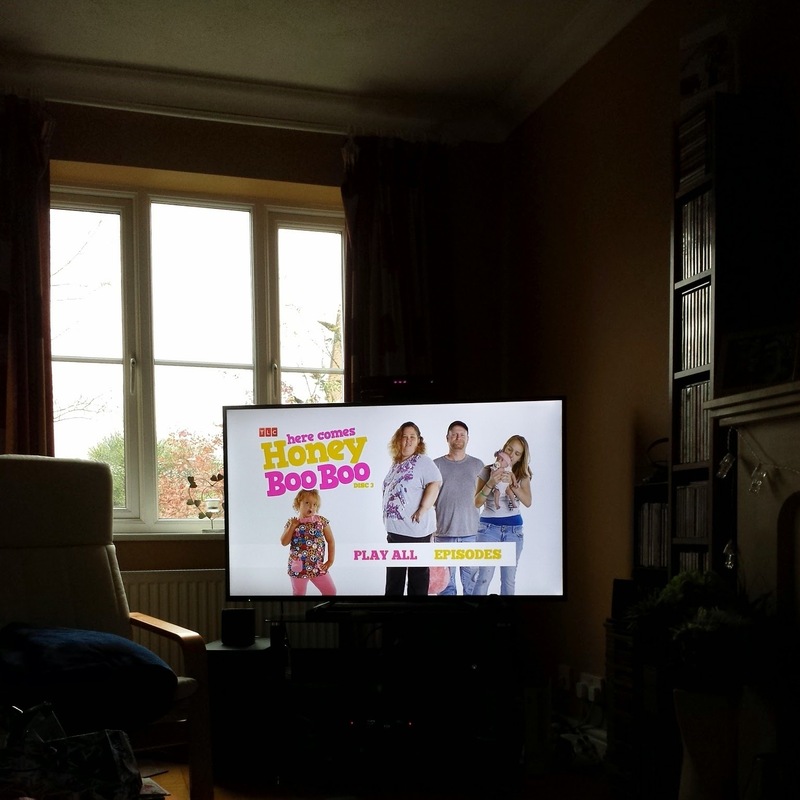 2pm: An amazing work colleague lent me the first season of Here Comes Honey Boo Boo for the weekend, so I devoured a fair chunk of that in the afternoon. I love trashy American reality TV, especially things like Toddlers and Tiaras and this show, so I was thoroughly enjoying myself. I did manage to watch the whole season between the time I got in from work on Friday and the middle of the afternoon on Saturday. Oops! 3pm: Recently I have tried to read blogs less on my phone and the iPad, and more on my laptop instead, so I can comment on them a lot easier. Comments on my blog make me so happy, and I really feel like I know the lovely regular commenters, so I thought it's about time I shared the love around a bit more. 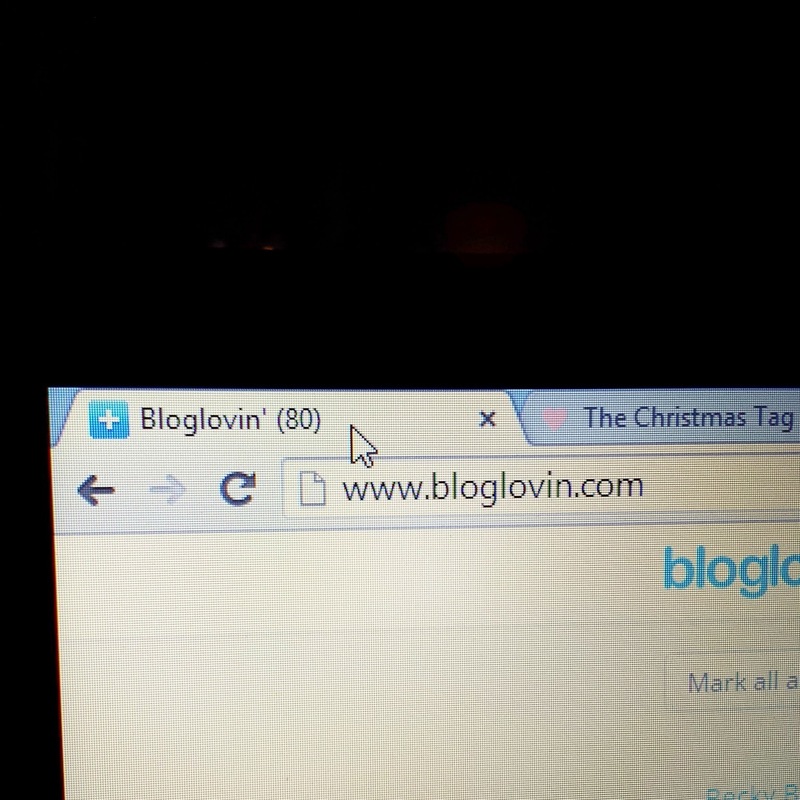 This did mean that I had an unread list of 80, but by the end of the night it was down to 0, with comments left on at least half of the posts. 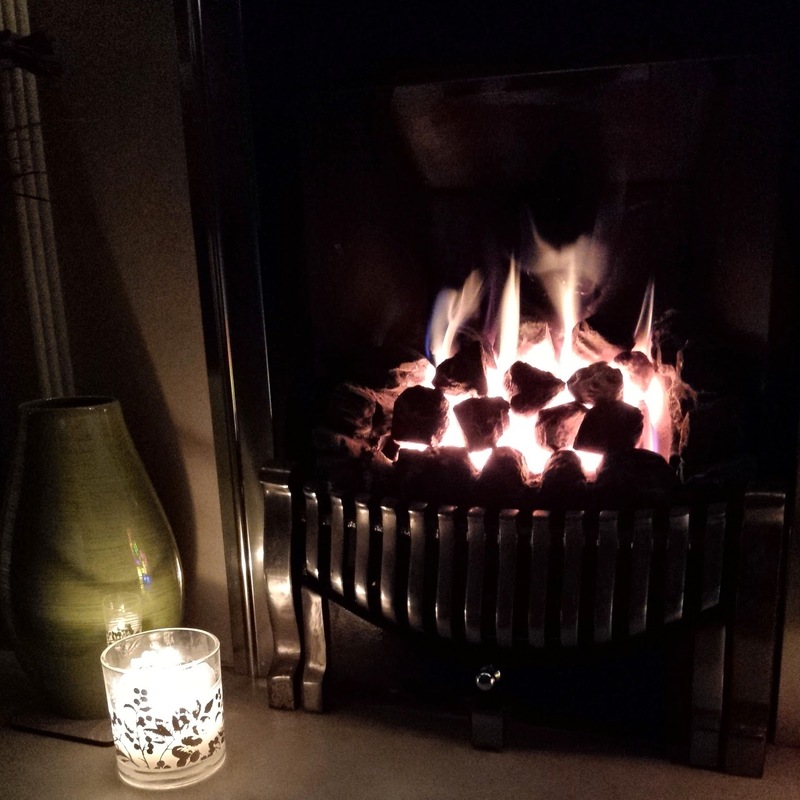 4pm: It was chuffing freezing on Saturday, so I put the fire on and lit my Christmas candle to feel nice and cosy. I didn't have a fire in my flat and I missed having one so much, there's something about having a fire that makes a place feel instantly like home. 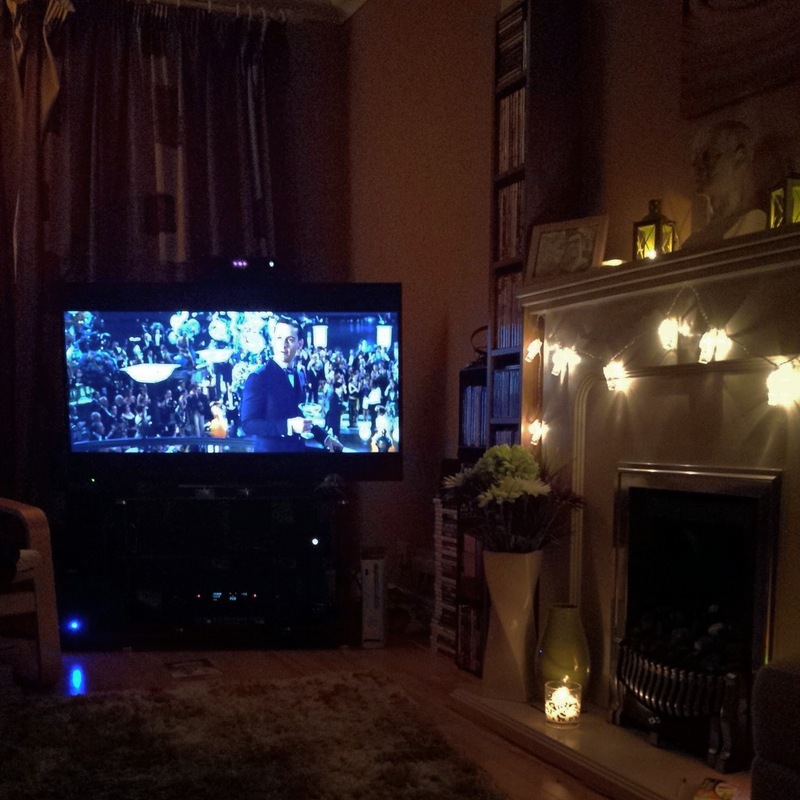 6pm: I watched the Great Gatsby whilst I ate tea. After hearing such great things about the book, I read it last year. I didn't rate the book that highly, as it was very classic in style, which isn't my sort of book, but I thought the film was worth a watch. My crush on Leo has absolutely nothing to do with this decision of course! I felt similar about the film as I did the book, however I loved the party scenes, and I am debating using elements of the film in my wedding, such as the opulence and the wildness of the party, whilst still staying classy of course! 7pm: Whilst watching the film, I was drinking diet coke out of my coke glass. This makes me far happier than I should admit to, but it always makes me feel far cooler than I am when I do this. 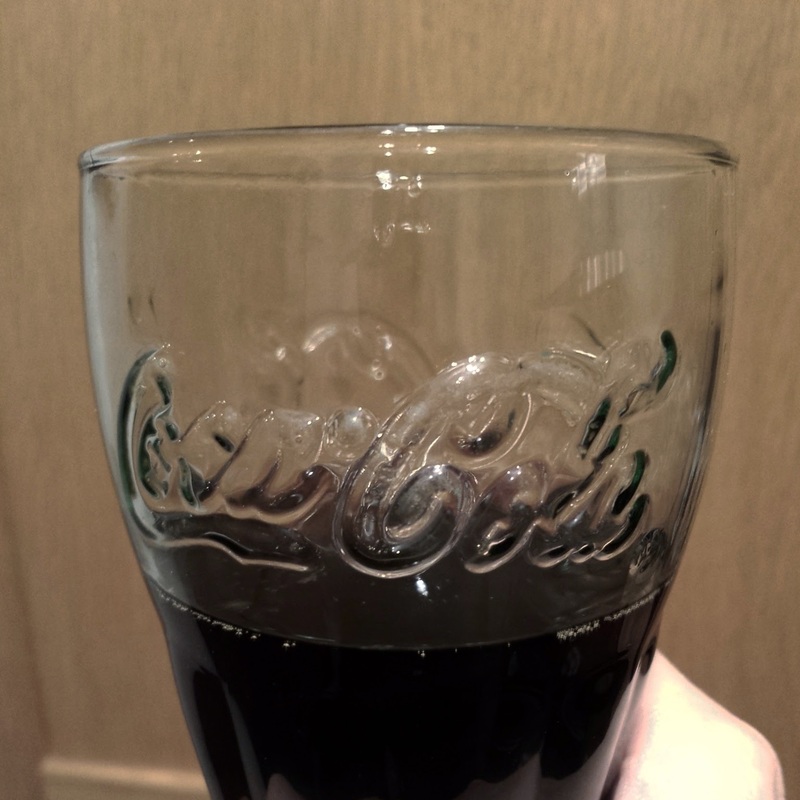 This coke glass is my favourite glass to drink out of, and I've had it for over 10 years now, it has survived so many moves and so many houses, I would be devastated if I ever broke it! 8pm: Shower and pyjamas time! 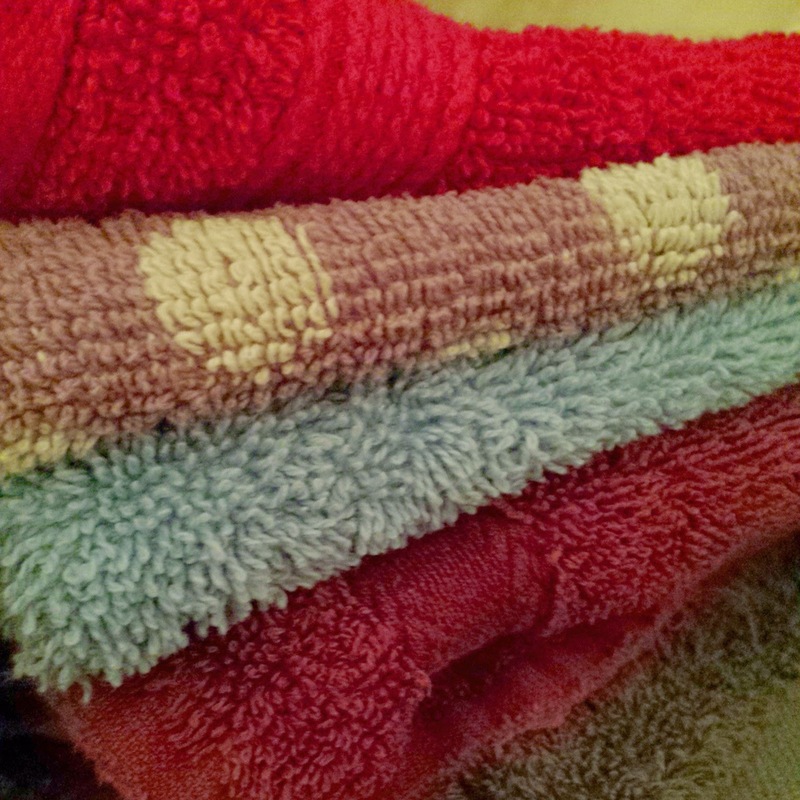 I struggled to think of how I could do a picture for this time, so resorted to taking a picture of my flannel stash. I always use a flannel to wash my face, I never feel clean if I just use my hands, and it is safe to say that I own a lot of flannels. 9pm: As I mentioned in my 5 ways to get ready quicker in a morning post, I make up my porridge mix in an evening and pop it in the fridge overnight. 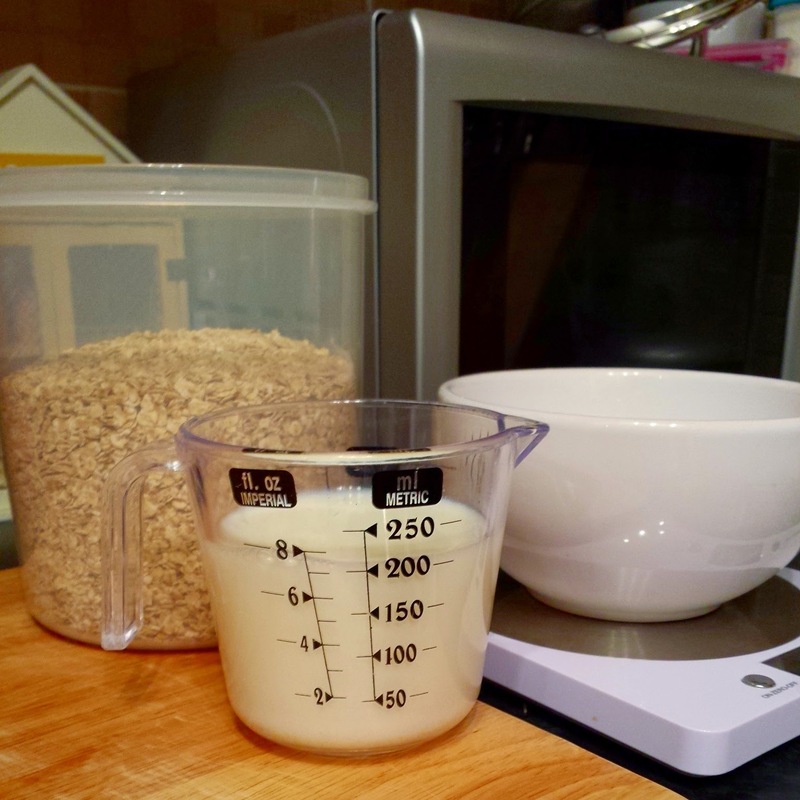 It means the oats soak up some of the milk and it makes it a far thicker, nicer porridge in my opinion. So that's what I was doing at 9pm on a Saturday night. I am so rock and roll it hurts. 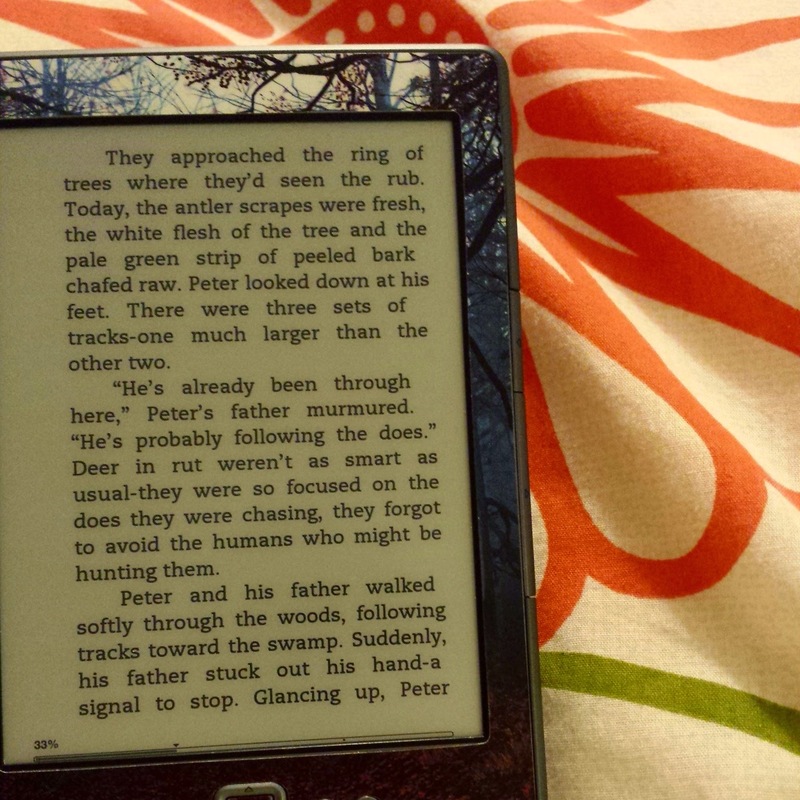 10pm: Just to emphasise my rock and roll-ness, I went to bed with my Kindle and read for ages before falling asleep. I'm currently reading Nineteen Minutes by Jodi Picoult, and it's interesting and enjoyable so far. I really feel for Peter, the protagonist, as he was bullied throughout his school life, so I can relate to this well. I didn't go to the extremes that he does though! If anyone's interested, I may post a review of this when I finish it. So that's it, my Saturday on my own, in photos. When I have plans things are usually more exciting, but this was a rare Saturday of nothing, so it represents what I get up to on my own fairly accurately. I really enjoyed completing the challenge, it made me far more aware of what I was doing, and looking for the photo opportunities in mundane moments. This may become a semi-regular thing, and if you want to be the first in on the action (and how can you resist knowing when I make my porridge in an evening?!) then you can follow me on Instagram @inelegantwench or Twitter with the same handle. It was a very productive busy day, my favourite kind of day! I am so jealous that you actually have a good excuse to put your tree up, I might have to instigate a pre-Christmas just so I can get mine up too! I REALLY wanted to do my Christmas shopping in Leeds this year as it's my new favourite shopping destination but I've completely run out of weekends and have no holiday days left :( Gutted cos I wanted to go to the Christmas Market too - I'll have to be more organised next year. Can't believe you were in the Supermarket for 8:00 am on a Saturday - that's good work! Even if I wake up mega early at the weekend it takes me forever to get ready cos I'm on go slow. I've not tried the orange hot chocolate yet (this is despite having 5 Christmas Drinks the week they came out!) .. have you tried the Starbucks Honey and Almond Hot Choc - it comes with chocolate cream on the top - AMAZING! That is gutting! It is the best shopping destination I have ever been to, it is as good as London, just not as spread out. Definitely get organised for next year and come to the best city ever! I haven't tried the Starbucks one yet, but you've sold me at the idea of chocolate cream, that'll be the next shopping trip treat. 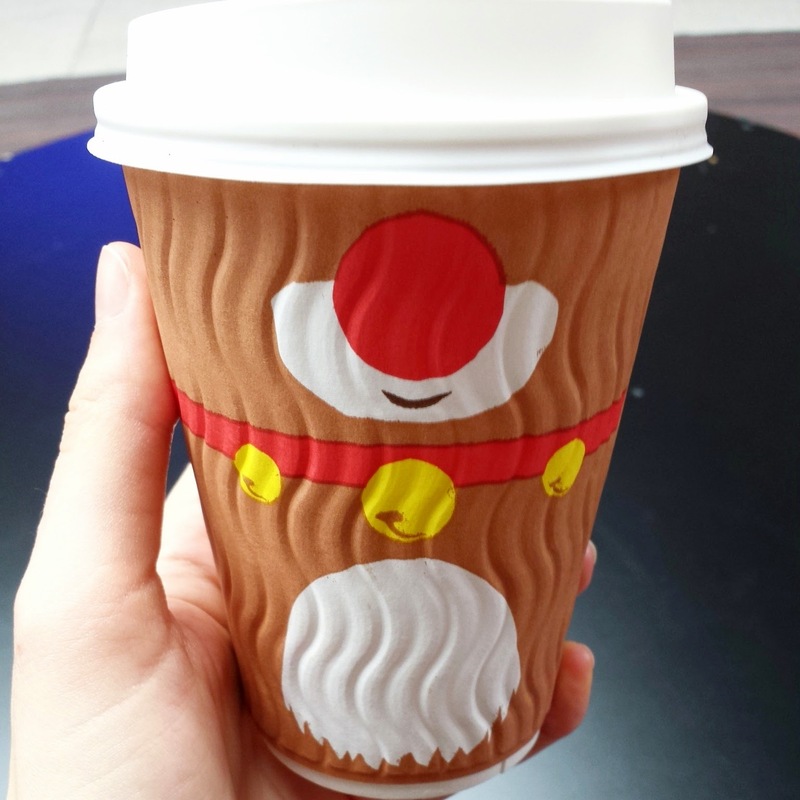 The Costa Christmas cups are soooooo cute, I've had a Santa and a snowman one!